There’s plenty to endear you to the sublime beach town of Placencia. Here are some of our favorite fun facts about our favorite seaside village. Placencia’s colonial history dates back to the 17th Century, when it was settled by Puritans from Nova Scotia. This group lasted only until the Central American wars of independence in the 1820s, at which point Placencia was resettled by a fishing community whose heritage is still evident today. The name Placencia comes from Punta Placentia, or “pleasant point”. Placencia was given this name by traveling Spaniards who were taken by its subtropical weather, cool breezes and warm waters. Placencia maintains an average temperature of 75-80°F (24-27°C), making it a paradise destination for vacationers and expats. In 2001 Hurricane Iris shook up much of Belize, with Placencia taking the brunt of the destruction. An estimated 95% of buildings were damaged, with Placencia’s famous boardwalk covered over by fallen structures. However, rebuilding initiatives and developer investment brought the peninsula back to its glory days – and beyond. Placencia has since become one of Belize’s most popular tourism destinations. Placencia’s main street is just a sliver of boardwalk that winds through the village. Legend has it that the Sidewalk was built for a local bishop whose soft feet couldn’t handle the beach terrain. And at just a few feet wide, it’s so narrow that it’s been recognized by the Guinness Book of Records as the world’s narrowest street. Built from concrete on a foundation of conch shells, the Sidewalk was the village’s only road until 1984 – and is actually wider today than when it was first constructed. Located at the southern tip of Belize, Placencia is a pristine peninsula with an incredible 16 miles of natural sandy beach to its name. A lagoon with a mangrove perimeter, lush green rainforest, twisting rivers and cayes encircled by coral reefs all add to its natural splendor. Cut off from the rest of Belize, it’s peaceful, tranquil and relatively untouched. The world’s second largest reef is just off the coast of Placencia, and the nearby waters are teeming with astonishing aquatic life. Just 30 miles away, Gladden Spit is a major tropical fish spawning site over the months of May – June, drawing the attention of whale sharks. Time it right, and you can scuba dive and snorkel with the world’s largest fish. Fragrant with tropical fruit trees and surrounded by sparkling waters, Placencia offers an incredible variety of food made with the freshest ingredients. Lobster, conch and lionfish are popular seafood offerings, and you’ll enjoy tamales and tacos alongside Caribbean-influenced dishes. Dozens of varieties of mangoes, fresh cashews, dragonfruit and water apples make for impressive fruit salads, while locally made chocolate, gelato and coconut pies will tempt those with a sweet tooth. There’s much to love about Placencia, and we hope that you’ll get to enjoy it firsthand. 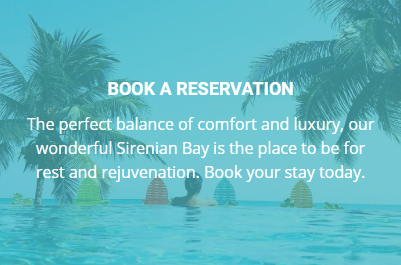 Stay with us at Sirenian Bay, and enjoy the very best Placencia has to offer.